Chamil Cooray maintained his rank as No. One player of Sri Lanka when he won his 9th“Grand Slam’ Men’s Singles defeating World Champ Nishantha Fernando at the ‘Grand Slam’ Carrom tournament 2016 organised and conducted by the Sri Lanka Carrom Federation concluded at the Carrom Federation Headquarters, Kohuwela last weekend. In the Women’s championship Chalani Lakmali emerged champion for the 5th time when she scored a fighting 2-1 victory over Yasikha Rahubaddha. In a tense battle for the Men’s title Nishantha Fernando gave a stiff opposition for the No. 1 ranked player in the second set scoring a 25/17 win. This brought the game to the deciding third set as Cooray had won the first game 25/15. Fortunes swung from side to side in the deciding set where Nishantha Fernando proved that he is still a player to be reckoned with by giving the champ a tough time. But in the end Chamil Cooray reached the winning post when the final score read 25/17. Final score: Chamil Cooray beat Nishantha Fernando 2-1 (25/15, 17/25, 25/17). Another tense battle was witnessed in the Women’s final as Chalani Lakmali was never allowed to sail to the champion destination when Yashika Rahubaddha took the match to the wire but went down fighting in the deciding third set as Lakmali edged to a 25/22 win. Chalani Lakmali beat Yashika Rahubaddha 2-1 (25/20, 16/25, 25/22). 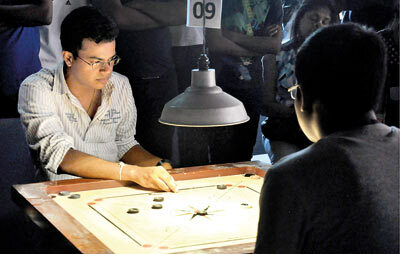 The best 32 players of Sri Lanka ranked after the 28th National Carrom Championship were qualified for the Grand Slam which was worked off giving the carrom enthusiasts their monies worth by witnessing top class slice work exhibited by the ranked players. Chamil Cooray (4), Nishantha Fernando (2), Anas Ahamed (2), Charith Madusanka (2), M. Sherifdeen (1), Brindley Wickremasinghe (1), Udesh Chandima (1) and Mohamed Shaheed (1). At the conclusion of the Grand Slam following players were selected for the national pool: Men’s: Chamil Cooray, Nishantha Fernando, Anas Ahamed, Mohamed Shaheed, Udesh Chandima, Prabath Yatawara, Brindley Wickremasinghe and Dimal Senaratne; Women’s: Chalani Lakmali, Yashika Rahubaddha, Joseph Roshita, Maduka Dilshani, Shasika Sandamali, Lihini Anjalika, Arosha Wickremasinghe and Detuni Nomaya.